InterNations Toronto 2019 Newcomers' Event! Are you new to Toronto or new to InterNations? Come join us to mingle and meet other expat newbies! 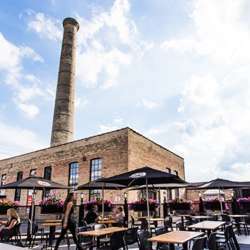 As our main venue Liberty Village at 3 Brewers is hosting us with another awesome night with DJ and the beer pong competition!!. Our Newcomers’ are meant to connect you with people from all over the world. Making friends is one of the first steps to make when you are new to a new country. As InterNations Newcomer Ambassadors, we were newcomers once too and understand the struggle so feel free to ask us any of your questions about Toronto and living in this beautiful city! The event will be host in an emerging art scene and modern eateries areas. The venue is one of the most recognized restaurant/bars for its homemade beer. Our Newcomers’ Event will start with the casual mixer, following by small introduction and the DJ after. Please message the ambassadors if you need more details, looking forward to seeing you all there!